A research team consisting of scientists from Kyoto University, Tokyo University of Science, National Institute for Physiological Sciences, and Tokyo Institute of Technology, report in the Journal of Virology the Medusavirus, a unique giant virus that gives pause to current theory on viral evolution. The name Medusavirus was given for the effect this virus has on its host, Acanthamoeba castellanii. Once infected, the amoeba forms cysts, a phenomenon called encystment. This is a typical response to environments hostile to survival, and leaves the amoeba with a hard, protective covering. 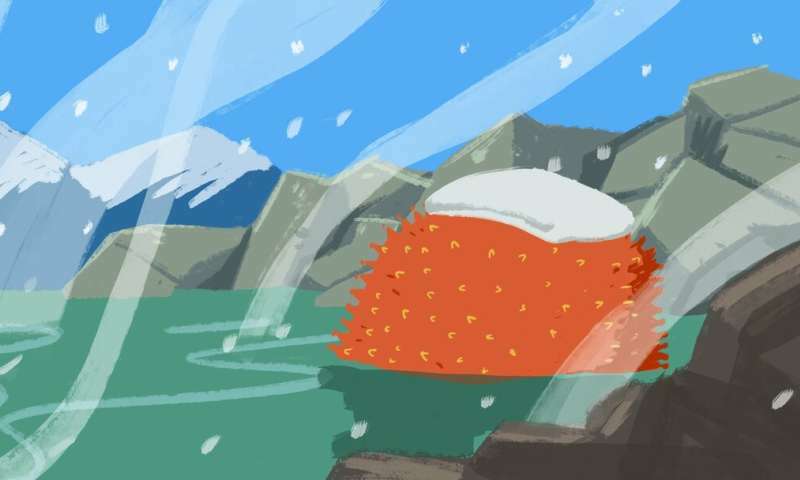 Perhaps it was not a coincidence then that Medusavirus was found in the hot springs in northern Japan, the first giant virus to have been isolated from a heated environment. Along with the location of its discovery, Medusavirus holds a number of distinguishing features compared with other giant viruses. Its DNA codes for all five types of histones, the key proteins that help compact DNA within the nucleus. In fact, no other known virus has all five types. Further, Medusavirus encoded neither RNA polymerase nor DNA topoimerase II, whereas all other giant viruses encode at least one. These features could explain why the replication of Medusavirus DNA begins and completes in the host nucleus to eventually fill the amoeba nucleus with viral DNA, which again is unlike other giant viruses. Moreover, the morphology of the capsid surface was unique, in that it was covered with an extraordinary number of spherical-headed spikes. In addition, the amoeba genome encoded several capsid surface proteins. The existence of histone genes in Medusavirus and capsid protein genes in amoeba suggest lateral gene transfer going both directions—host-to-virus and virus-to-host. Overall, the findings suggest that Medusavirus offers a new model for host-virus co-evolution and that the Medusavirus is a new family of large DNA viruses.